This website is about spinning, and fiber, and yarn, and joy. My name is Ruth MacGregor. 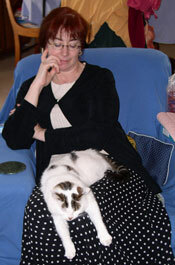 I'm the one wearing glasses in the photo (left), and I'm webmaster of this site. For more than twenty-five years I've been twisting fiber into yarn; and for much of that time I was a "spinner without a cause", spinning just for the joy of it. That path led to fascinating places, many of which you'll see here as this website grows. Many paths can take you to the same destination. The truth is there are very few absolute rules in spinning. The worth of any technique shows in the yarn you produce with it. ...If you think about it, that works as a metaphor for living as well. Limitations in equipment can help you overcome your own. To put it another way, the tool doesn't make the spinner. By the way, if you'd like to contact me, click here. For anti-spam reasons, that's the Webmaster address; but know that I'll be the one to read your message. And I'd love to hear from you! 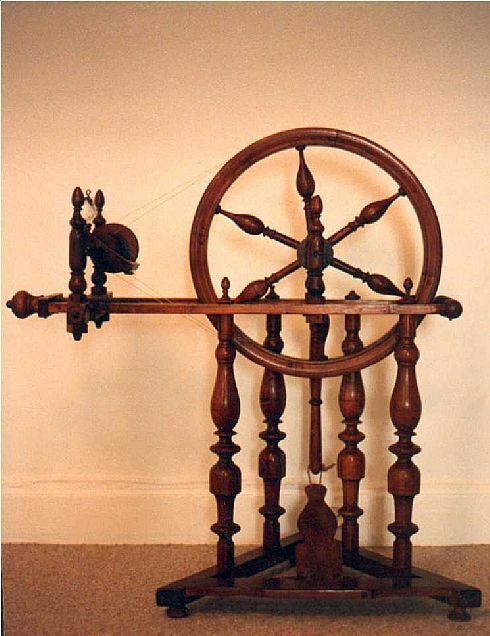 Now, to get back to our sheep (as we say in France) -- here at our house, a small group of wheels joins a crowd of spindles to form my spinning family. 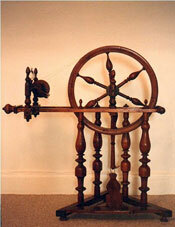 The spindles come from many sources and eras, and you'll see them as they work -- I won't list them here. This wheel (on the right) is a Louet S70, the first wheel I ever purchased. It's the only solid-oak wheel Louet has made to date, and they made them for that year only. It came as an unfinished kit, and I still remember sanding with increasingly fine grades of sandpaper until the wood grain glowed, then gently brushing it with low-sheen varnish -- all the while dreaming of an abundance of future yarns. It's not an exaggeration to say that this is the wheel that taught me to spin. At the time of its purchase, I was a brand-new spinner who could just put a yarn together; but this wheel was patient and forgiving and gradually gave me a solid base for understanding twist, drafting, and attenuation. As originally sold, it was best suited for spinning lofty, thickish wool yarns; but the world changes, and so do wheels. This wheel was upgraded twelve or so years ago with a new flyer and bobbins to match the modern Louet standards. It now can spin all but the finest of delicate yarns. 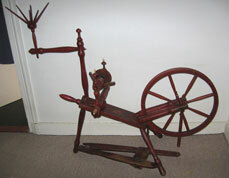 This is an antique great wheel from the western United States. The accelerating head in the photo is a replica of the original, which showed such dramatic signs of wear that I was afraid it would break in normal use. The original head still bore remnants of a paper label admonishing the spinner to lubricate all parts before spinning. This was the first completely intact wheel I'd seen in an antique shop; with just the addition of drive bands, it was in spinning condition as soon as I got it home. That's lucky! Most old wheels in antique shops are incomplete, or in pieces -- or worse, have been cobbled together from likely-looking wooden parts. 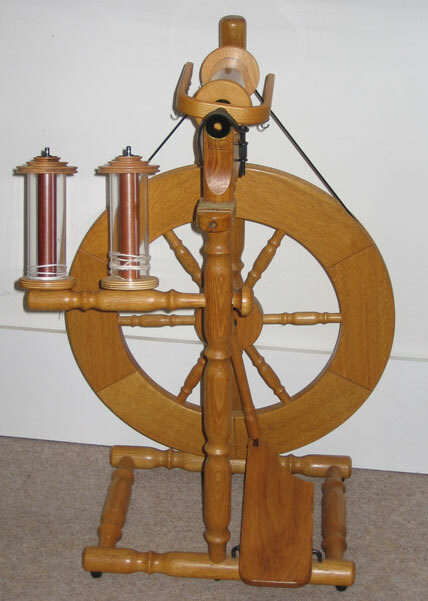 Shortly after buying this wheel, I fell helplessly in love with spinning on a spindle wheel. There is a rhythm and sound to this kind of spinning that's unmatched elsewhere, and the size of the wheel transforms the spinning itself into a kind of dance. This is another antique wheel, this time from the Morvan, a rural area in central France, well removed from the influence of large cities. I've seen several photos of wheels like this from the end of the 19th century, with similar sizes and turnings; and they all seem to have come from the area stretching from the Morvan eastward through Burgundy and into the Jura. This wheel is a "double drive" wheel -- in other words, the drive band is one long loop which passes around the drive wheel, around a pulley on the flyer, around the drive wheel again, and around a pulley on the bobbin. Like many experienced things, the wheel's history is written on its face: deep grooves have been worn in its hooks and flyer where the new yarn passed on its way to the bobbin. It has seen hard use spinning flax or hemp -- or both. In action, the wheel is loose-jointed and clackety; but it spins a wonderfully smooth, fine yarn. Despite the clacking, its performance can't be matched by any of the other, younger wheels for spinning flax and hemp. Old habits are sometimes permanent, even for wheels. 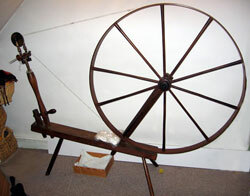 This modern wheel is the "Lewis", made by the Haldane company in Fife, Scotland. According to its original owner, this was one of their early production models -- later versions had a larger-diameter drive wheel. It was supplied with "double drive"; I have since converted it to the "flyer-lead" system used in the Outer Hebrides. The Haldane company still exists, but they no longer make spinning wheels. When I found this wheel, I was actually seeking an old Hebridean wheel -- from, say, the Isle of Lewis. On a trip through the Hebrides, I'd had the chance to spin on several of those wheels (the real ones! ), and they are wonderful tools for spinning an even, fairly fine woolen yarn. A true Hebridean wheel escaped my purchase (alas! ), but this Haldane wheel spins with a remarkably similar feel. We've become excellent friends. In the fall of 2005, I joined in a "historical heritage" day in the village of Jouarre, not far from Paris. Jouarre is the site of the largest intact Mérovingean crypt in Europe; but rather than limit the focus to that period, the event's organizers expanded it to embrace the whole of the Middle Ages. That posed a small problem for the spinning demonstration. 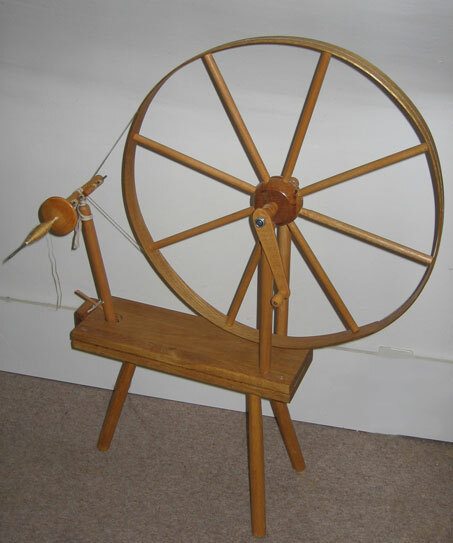 Until the very end of the medieval period, all spinning in western Europe was done on spindles, with a long distaff tucked under the arm for spinning flax and hemp. I had the spindles and distaff; but in an outdoor "faire" setting, most people expect a spinner to have a spinning wheel -- and many are reluctant to approach a spindler with questions, but eager to talk to someone with a wheel. The only wheel existent in medieval Europe appeared at the very end of the Middle Ages, in just the last fifty or so years of the period. 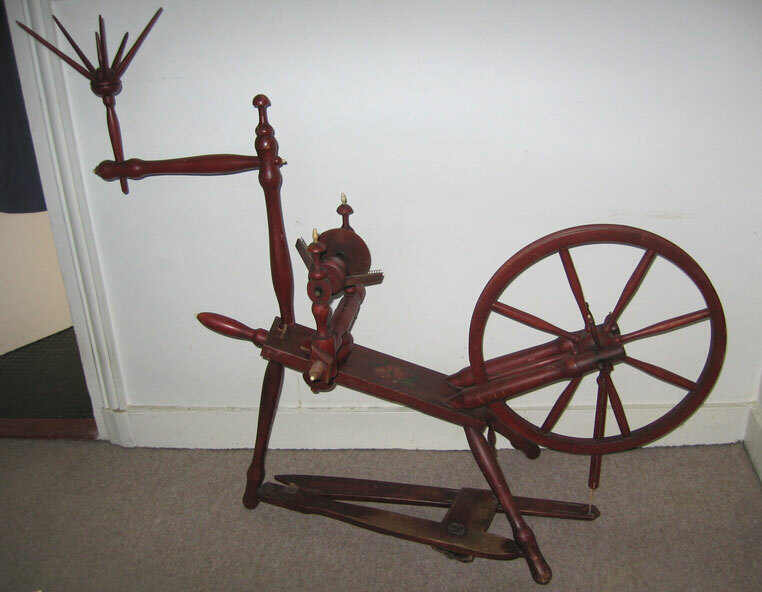 It was a small spindle wheel, sometimes equipped with a crank to turn the wheel. Those are not commercially available in our modern world... so I made my own. And darned if it isn't a wonderful thing. It spins like a charm! This interesting wheel came from northern Holland, and like so many of the wheels living here, is "of a certain age". Its exact history is unknown, but this style of wheel seems to have been common throughout Holland and Belgium -- an area known for fine flax production. And this is a flax wheel! The distinctive tow distaff attests to that, as does the small orifice and the grooves worn into the flyer arms by new yarn on its way toward the bobbin. One of the things you can't tell from the photo is that the wheel is surprisingly tiny: when I stand next to it, the top of the distaff is not quite level with my waist, and the top of the drive wheel barely clears my knee. The wheel is a warm red color, and a small bouquet of painted roses adorns its bench. There are tiny ivory trimmings on the ends of each turned piece (real or artificial ivory, I can't tell), and the treadle and footman are outlined with a narrow line of gold paint. Tiny and dressy, this wheel spins true. 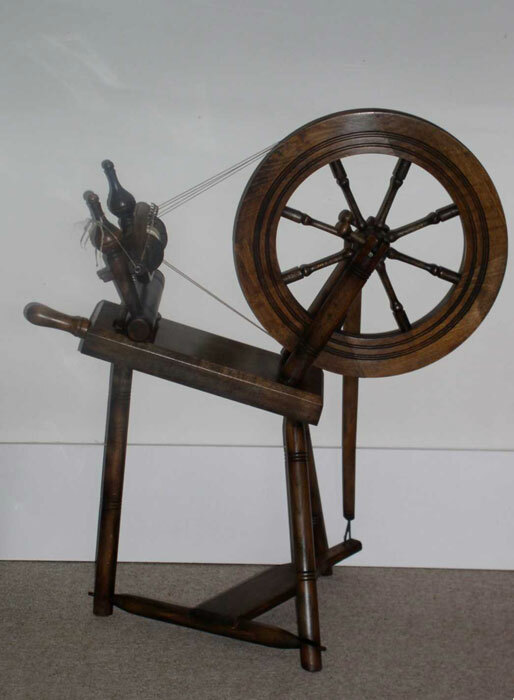 It runs smoothly and silently, and despite its small size is nicely efficient for spinning flax. It was an impulse buy (at an irresistible price), but I have absolutely no regrets!